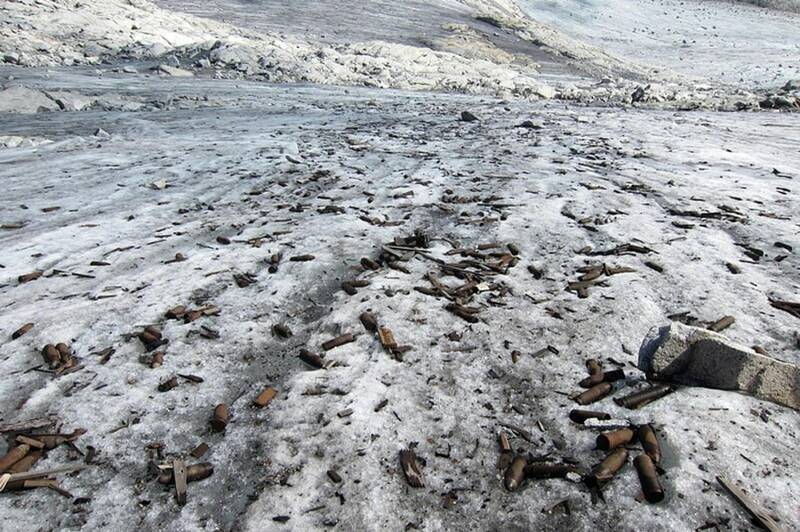 Some of the more than 200 pieces of World War I ammunition which emerged from a melting glacier on a Trentino mountain peak are seen, Aug. 31. 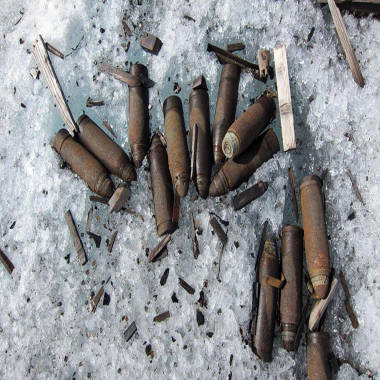 Each piece weighs between 7-10 kilos, and the 85-100 mm caliber explosive devices were found at an altitude of 3,200 meters, when a once-perennial glacier on the Ago de Nardis peak partially melted due to a recent heat wave that reached into Italy's highest peaks. The Finance Police Alpine rescue unit, operating in the area between Pinzolo and Madonna di Campiglio, saw brownish metal points emerging from the ice, got a fix on them via GPS, and then extricated the ordnance. The pieces were spread over a 100-square-meter area during series of battles fought between the armies of Austria-Hungary and Italy in northern Italy between 1915 and 1918. Disposal specialists returned to dispose of the munitions.